Virtual Desktop Infrastructure (VDI) is being widely deployed by IT managers to centralize employee desktops, applications, and data in the data center. Most VDI solutions run in a virtualized data center environment to further improve the manageability and security derived from consolidating hundreds and thousands of desktops to run on a few powerful servers. Desktop virtualization can simplify operations, improve data security, and lower your total cost of ownership. 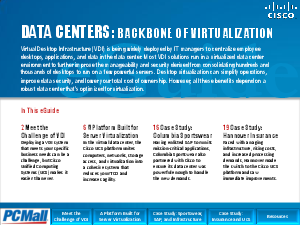 This eGuide highlights how to harness the benefits of Virtual Desktop Infrastructure using a robust data center that is optimized for virtualization.